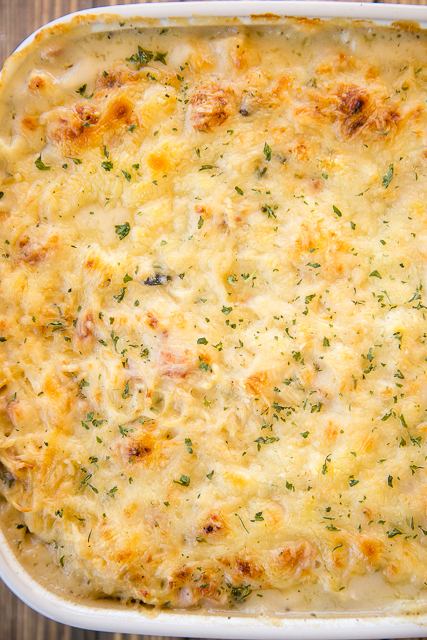 Chicken Cordon Bleu Tetrazzini - we are obsessed with this yummy casserole!! Chicken, ham, swiss cheese, mushroom soup, Alfredo sauce, chicken broth, pasta and parmesan. So quick and easy to make. Can make ahead of time and freeze for later. We make this at least once a month. It always receives rave reviews!!! We love this easy casserole recipe. Make sure to save some of that Easter ham for this Chicken Cordon Bleu Tetrazzini. O-M-G! This is a new favorite. We both absolutely LOVED this casserole. Chicken, ham, Alfredo sauce, Swiss cheese and pasta. Heaven! You can make this ahead of time and refrigerate or even freeze for later. I love easy make ahead recipes! I used a tub of refrigerated Alfredo sauce in this Chicken Cordon Bleu Tetrazzini. I found it next to the refrigerated fresh pasta near the cheese at my grocery store. If you can't find the refrigerated sauce, you could use an equal amount of the jarred Alfredo sauce. 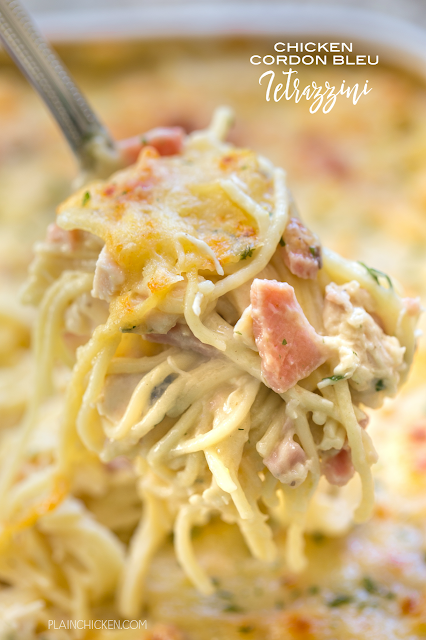 This Chicken Cordon Bleu Tetrazzini is a new favorite in our house. I can't wait to make it again next week with some of our leftover ham. I just love the flavor combination! I am getting hungry just thinking about this yummy casserole!!! Meanwhile, stir together chicken, ham, 1/2 cup Swiss cheese, cream of mushroom soup, Alfredo sauce, chicken broth and pepper; stir in pasta. Spoon mixture into a lightly greased 11- x 7-inch baking dish. Sprinkle with remaining 1/2 cup Swiss cheese and 1/4 cup grated Parmesan cheese. Bake for 35 minutes or until bubbly. Turn on broiler and cook until cheese is brown. Great recipe! I changed it slightly to make it vegetarian for several family members and served ham & chicken on the side for the carnivores. If you're looking to use up some mushrooms in your fridge this recipe is a winner! I added a little cayenne pepper for spice but that's just personal preference. This recipe is awesome as is and I love that it is so versatile! Thank you, Stephanie! Oh my goodness! This recipe was delicious. Our family loved it and we have some picky eaters (ie the kids ��). We will definitely add this recipe to our family dinner repertoire. Thanks for sharing with us! This recipe is sooo delicious! I've been waiting for Easter so I could have left over ham so I could make this yummy dish again. This is in our dinner rotation at least every other week. My husband is such a picky eater and he can't get enough of this when I make it. Thank you so very much Stephanie for sharing this recipe. It's definitely a hit in my house! Would you double it for a 13 x9 pan?? ?